In a Nutshell: In the digital age, customer loyalty is dependent on creating personalized brand experiences across all points of a shopper’s journey, not just during purchases. As retailers shift marketing focus, they need both data and a platform that enables them to visualize customers in real time and reach out with personalized content. Sitecore empowers retailers and marketers with the integrated data and commerce platforms they need. And its implementation partners help businesses create the satisfying customer experiences that foster stronger brand loyalty. Brand loyalty can no longer be taken for granted in the digital age of endless options. Both online and in-store shoppers have made it clear that personalization — not mass marketing — holds the key to shaping brand perception and influencing purchases. Many retailers are unable to provide those personalized experiences because they’ve lost sight of who their customers are. For some, it’s a failure to consider the entire customer journey — from the first impression to click-through to purchase. Sitecore, an experience management software company, is on a mission to help businesses confronting that disconnect. Sitecore EVP of Product Ryan Donovan, left, and VP of Communications and Content Marketing Charlotte Ziems spoke with us about the benefits of implementing the company’s commerce experience software. Other businesses collect customer data from numerous channels but can’t integrate it in a way that helps identify and reach customers with the right message. In a customer experience survey sponsored by Sitecore, 65% of brand respondents reported that they use data analytics software, but only 12% said they could collect online data on individual customers. Sitecore spoke to these pain points and the survey results at its recent Symposium in Las Vegas, where it announced new capabilities and upgrades to Version 9 of its flagship product, Sitecore Experience Platform. Sitecore helps brands gain visibility of customers and contextualize their marketing efforts to create optimized shopping experiences that lead to greater brand loyalty. The Sitecore Experience Cloud platform provides an all-in-one solution with its back-end Sitecore Experience Database (xDB) and user-facing content management system xManager (xM). The platform allows retailers and marketers to collect real-time customer data, gain insights into their preferences and habits, and deliver personalized, brand-consistent experiences across multiple channels. And with the latest release of Experience Platform, Sitecore has upgraded those capabilities. Sitecore Experience Platform is equipped with a powerful machine-learning engine — Sitecore Cortex — and a new API framework known as xConnect, which consolidates experiences across channels. 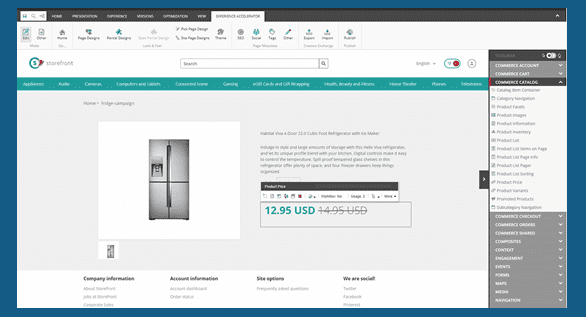 “It can be used to import all your POS and IoT data to personalize the digital experience based on the totality of interactions, as opposed to what’s going on in just one digital channel,” Ryan explained. Retailers find xConnect especially useful for managing customer returns. Without a way to integrate sales channels, retailers aren’t notified when a customer purchases an item online but returns it in-store. Sitecore lets retailers see this information in real time. So, instead of upselling the customer on a related product or asking for a review, a retailer can recognize the transaction is a return and move to the next personalized experience for that individual. With xConnect, Sitecore Experience Platform delivers a 360-degree view of customer activity across all the touchpoints. That helps brands provide the personalized experience their audiences demand and anticipate needs with greater accuracy. Retailers understand that commerce is now about the overall experience, not just the sale. To create exceptional experiences, they need to observe the places and ways their customers interact with them, and many of those interactions happen on e-commerce platforms. Sitecore designed Experience Commerce (XC) to bring together its Experience Platform with a commerce solution. “We see the opportunity to marry content and commerce to create experiences that address the pain points of digital marketers today,” Ryan said. Although it’s sold as a separate product, Experience Commerce includes the Experience Platform and can be run on the Experience Cloud for instant set-up and configuration. Through Experience Commerce, retailers have the freedom to customize content and features for web pages, mobile devices, and other formats in customer-facing channels. Users can also test checkout and shipping features to find ways to further improve experiences. Experience Commerce is a comprehensive tool that not only gains insights, but also owns the customer experience, boosting satisfaction, and fostering long-term relationships. Because retail is so fast-paced, Sitecore offers a built-in Experience Accelerator to speed up the implementation process. “If you were doing a bare metal deployment, Experience Accelerator can shave 60% to 80% off the time of our implementation. Some of the early adopters have seen some incredible successes,” Ryan said. Sitecore also has consultation services through its Business Optimization Strategy (SBOS) team to help subscribers integrate new technology and marketing strategies. 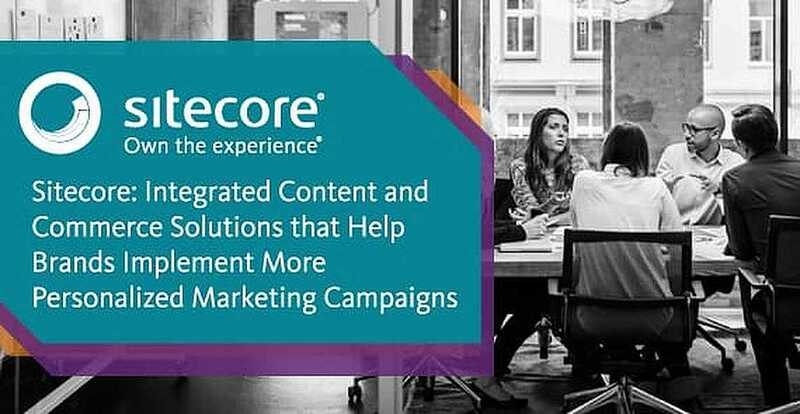 SBOS also runs the Sitecore Experience Xccelerate program to give select businesses more intensive help in revamping their contextual marketing strategies. Today, in-store and e-commerce marketing is about creating integrated, personalized experiences, not just about tracking transactions. Sitecore has brought robust data analysis and multi-channel integration to a platform that connects between every point of the customer journey. Sitecore views technology and data as the keys to forming a single view of the customer and delivering a personal, relevant experience. “We can make life better for digital marketers by giving them a better toolset that does everything,” Ryan said. As Sitecore helps retailers connect points in customer journeys and personalize experiences, it strengthens the bond between customers and retailers. “Our vision is to stand and advocate for that relationship between the consumer and the brand. We want that relationship to be better for both of them,” Charlotte said.